Size: 20 x 16.5 inches. Title: ' Cantagrigiensis comitatus Cambridgshire'. 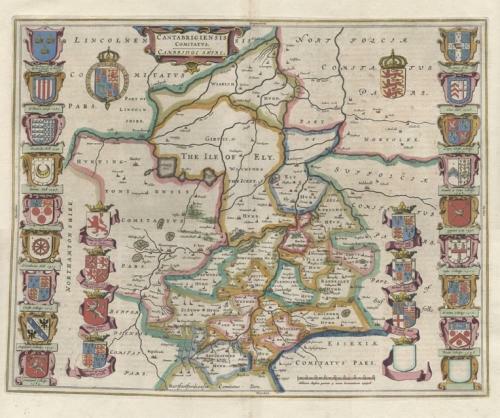 A hand-coloured double-page engraved map with Latin text on verso, flanked at the sides with 17 coats of arms of the Cambridge colleges, plus a blank shield, and seven family coats of arms, plus a blank. The condition is very good with slight scattered foxing. There are some very minor creases parallel to the centrefold within the image area.